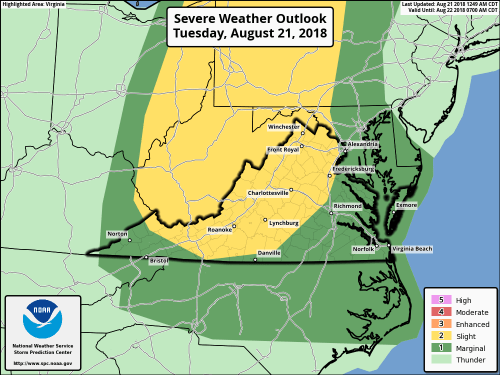 The Storm Prediction Center has placed much of the Central Virginia in the slight risk category for severe weather this Tuesday – August 21, 2018. That means there Is a decent shot at severe storms somewhere in the area highlighted in yellow. Certain factors are coming together today to create an environment that makes severe weather possible across the Blue Ridge area. The Storm Prediction Center discusses the potential in this post. It’s mostly science and weather speak. But it generally says the chances are there for some severe weather outbreaks in our area. A lot of that will depend on cloud cover. If we get breaks of sunshine the risk for severe storms is greater. I’ll keep you posted throughout the day should any real concerns arise.